Mahendra Singh Dhoni celebrates his 36th birthday on the 7th of July. He is currently in the twilight of his career. While he has had his fair share of critics, there is no doubting his class and pedigree both as a wicketkeeper and batsman. He led his country with distinction and holds the record for the most matches as captain in international cricket (331 across all formats). While the jury is still out as to whether he can keep going and play for India in the 2019 World Cup, there is no doubting his commitment and his desire to give his best for India. Even at 36, his fitness levels remain as high as ever and the only question mark over his participation in the 2019 World Cup is whether he can maintain his form with the bat. When he started his career, he was average with the gloves, but made rapid improvements and with time became a safe and solid keeper. He has the fastest pair of hands behind the stumps and pulls of stumpings with ridiculous ease. In addition to wearing many hats, Dhoni has been a great role model and ambassador for his country. While everyone is aware of Dhoni’s prowess with the bat, it is a myth that he was not capable in the Test arena. As we pay tribute to him here are some of the highlights of his career in Tests and ODIs. 60 - There have been 29 wicketkeepers who have led their country in Tests. Dhoni has led India in 60 Tests while donning the gloves. The enormity of the achievement can be gauged from the fact that the next highest is just 26 by Mushfiqur Rahim. 6 - Dhoni is 6th in the list of most matches in which a player has captained his country. The five above him are Graeme Smith, Allan Border, Steve Fleming, Ricky Ponting and Clive Lloyd. 3,454 - Dhoni as scored 3,454 runs as captain of India, which is the most by an Indian captain. Sunil Gavaskar is the only other Indian player to score more than 3,000 runs as captain. 4,876 - Dhoni has scored 4,876 runs as wicketkeeper for India. This is 2,117 runs more than Syed Kirmani who is in 2nd in this list. His run aggregate as Test wicketkeeper is 3rd on the all-time list after Adam Gilchrist and Mark Boucher who scored 5,570 and 5,515 runs respectively. 6/33 - Dhoni has scored 6 centuries and 33 fifties, both of which are records for an Indian wicketkeeper. 38.09 - Dhoni has a batting average of 38.09 as wicketkeeper for India, which is the highest by any wicketkeeper who has played more than 3 Tests for India. 2,496/32.84 - Dhoni has scored 2,496 runs as wicketkeeper for India away from home, which is an Indian record. His batting average of 32.84 away from home is the highest by anyone who has donned the gloves in more than one Test. 224 - Dhoni scored 224 against Australia at Chennai in 2013. This is the highest by an Indian wicketkeeper and the 3rd highest overall by a wicketkeeper in Tests after 232* by Andy Flower and 230 by Kumar Sangakkara. It is also the 2nd highest score by any Indian captain after Virat Kohli’s 235 against England. 9,410/295 - After the conclusion of the 4th ODI against West Indies, Dhoni had amassed 9,410 runs in 295 ODIs at an average of 51.32. Both of these are the 2nd highest runs scored and matches played by a wicketkeeper in ODIs after Kumar Sangakkara, who scored 13,341 runs in 360 ODIs at 43.74. 10 - Dhoni has scored 10 centuries as wicketkeeper in ODIs. This is the 4th highest after Kumar Sangakkara, Adam Gilchrist, Quinton De Kock. AB de Villiers also has 10 centuries to his name. 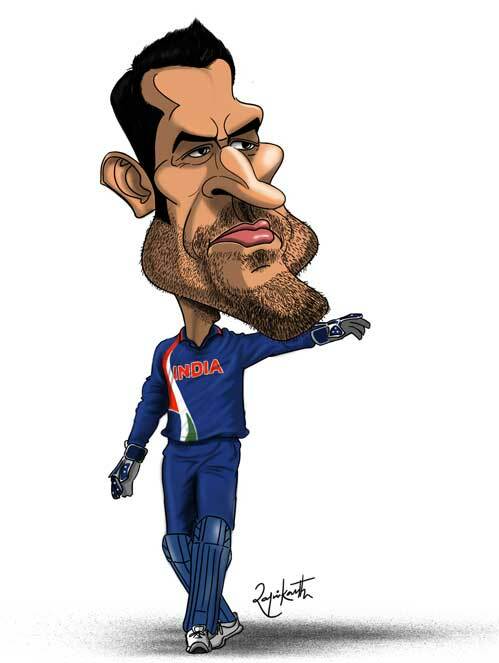 64 - He has scored 64 fifties as wicketkeeper in ODIs, which is the 2nd highest after Sangakkara who has scored 91. 6,633/199 - Dhoni has scored 6,633 runs in 199 ODIs as captain of India. Both of these are Indian records. Only Ricky Ponting and Stephen Fleming have led their respective countries in more ODIs than Dhoni, with 230 and 218 respectively. 183* - Dhoni scored 183* against Sri Lanka at Jaipur on 31st October 2005. This is the highest score by a wicketkeeper in ODIs and the 2nd highest score in a run chase after Shane Watson’s 185* against Bangladesh at Dhaka on 11th April 2011. 97.36 - Dhoni has a batting average of 97.36 in 91 successful chases in ODIs. This is the highest among anyone who has batted in more than 14 innings. 38 - Dhoni has remained unbeaten in 38 successful run chases in ODIs, which is a world record. 373 - Dhoni has 373 dismissals as wicketkeeper in ODIs which is the 4th highest in the world after Sangakkara, Gilchrist and Boucher. He has 97 stumpings to his name which is the 2nd highest after Sangakkara, who has stumped 99. Even if Dhoni does not feature in the 2019 Cricket World Cup, the fact remains that he has given yeoman service to Indian cricket. Let us salute him for his stupendous achievements and be proud of what he has achieved in the cricketing arena.